With Millions Spent, GOP 'Investors' Saw Little Return Election Night : It's All Politics A "return on investment" is a concept better known to Wall Street than to Washington. But after President Obama and the Democrats won most of the close elections last week, there are questions about the seven- and eight-figure "investments" made by dozens of conservative donors. 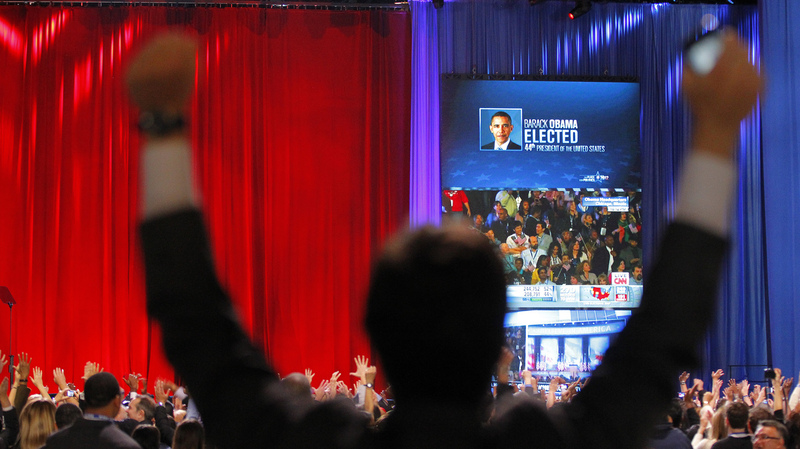 A supporter of President Barack Obama raises his arms as it is announced that Obama was re-elected during an election night watch party in Chicago. A "return on investment" is a concept better known to Wall Street than to Washington. But after President Obama and the Democrats won most of the close elections last week there are questions about the seven- and eight-figure "investments" made by dozens of conservative donors. During the election season, it was pretty common to hear about donors making "investments" in superPACs and other outside groups, rather than a "political contribution," perhaps because the phrase has a sort of taint to it. 'Let Mitt Be Mitt': But Who Was He? Bill Allison, editorial director at the nonpartisan Sunlight Foundation, says it also reflects the priorities of the donors themselves. "I think that an awful lot of the time, they're thinking in terms of their bottom line," Allison says, "which is why I think this language has come up so much." So the Sunlight Foundation calculated the return on these investments, at least on the contributions that have been disclosed. They found that a lot of the really big, much lauded superPACs kinda "fell flat on their faces," he says. Exhibit A might be the American Crossroads organization, with strategist Karl Rove, among others, at the helm. The superPAC backed seven losing candidates and just two winners. The social welfare advocacy group Crossroads GPS did slightly better: 19 losers and 7 winners. Spending by the two groups totaled about $277 million. Karl Rove has been defending the record of both groups. On Fox News last week, he said that President Obama's victory would've been bigger if the Crossroads TV campaign hadn't leveled the playing field. He also said the Obama campaign played dirty with its TV ads. "The president ... succeeded by suppressing the vote," Rove said on Fox News. Rove said the president's campaign did that by basically painting Romney as "simply a rich guy who only cares about himself." It's certainly true that the Obama campaign portrayed Mitt Romney as exactly that. Of course, starting a year earlier Crossroads GPS had begun running ads depicting the president as inept or sleazy. Sometimes, the investment strategies of the super donors have seemed a little muddled. Casino magnate Sheldon Adelson and his wife Miriam gave nearly $54 million to groups backing GOP candidates. But back in January, one of those candidates was Newt Gingrich, who was then battling Romney for the nomination. With Adelson's money, the pro-Gingrich superPAC ran ads that went where Republicans had been afraid to go: a head-on assault on Romney's record as a private equity investor. "For tens of thousands of Americans, the suffering began," one ad begins over an ominous soundtrack, "when Mitt Romney came to town." Adelson and his wife ultimately gave the pro-Gingrich superPAC $20 million. Gingrich was able to stay in the race and Romney was prevented from moving toward the center for the general election. The Adelsons got some of their money back from the pro-Gingrich superPAC and gave it to the pro-Romney superPAC after he won the nomination. Meanwhile, Democrats got the green light to go after Romney's business career. SuperPACs supporting President Obama, like Priorities USA Action, have their own list of million-dollar donors. Right now, their return on investment looks pretty good.